One system for all of your temperature, humidity and pressure related needs. 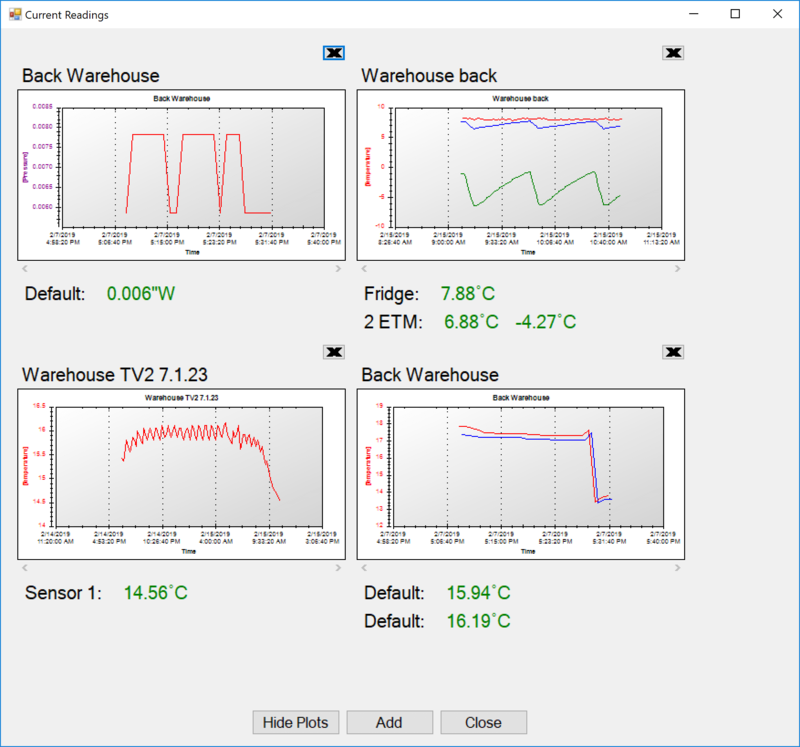 Easy-touch monitor logs, charts and alarms for temperature, humidity and pressure. Text email and phone alerts. The TV2 monitors, logs, charts and alarms with one display. A low-cost solution for protecting and documenting any temperature, humidity and pressurized areas. Free secure PC interface software;. TEXT, EMAIL, PHONE ALERTS FOR ALL ALARMS! Sockets for four wired or wireless sensors. High – Low audible & visual alarms for each sensor. Automatically logging of all measured variables. Sensors for temperature between -200°C and 1250°C. 72 hour internal rechargeable battery Backup. Complies with all federal recommendations. Displays maximum and minimum conditions. The TV2 Master Thermometer alarms, monitors, logs and charts environmental variables. Sensors for monitoring temperature, relative humidity and differential pressure can be mixed and matched in any combination. The TV2 monitor can be configured for wired or wireless sensors. The monitor stores over 80,000 data points for each sensor in non-volatile memory. 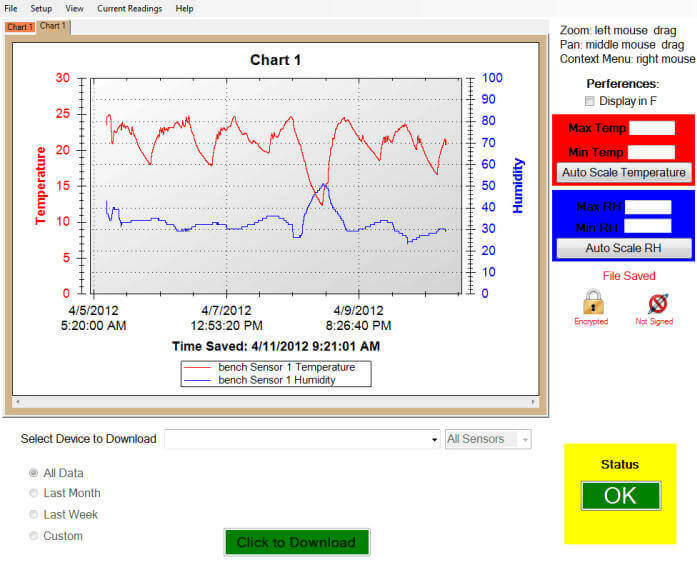 All logged data can be viewed on the monitor as a chart as well as downloaded to a PC with the free TView software. The chart can be scrolled through, and expanded to show a year of data or compressed to show individually logged data points. The monitor can be linked to any PC on the same Local Area Network, so logged data is automatically copied to the network. Because of the way the data is displayed, trends can be spotted and individual data points be examined. The display has no moving parts, requires no paper, pens or ongoing maintenance. 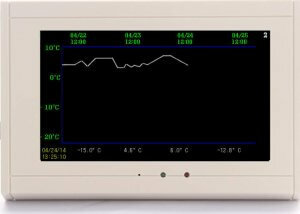 The Master Thermometer is a combination data logger and chart recorder, combining the visual aspect of a chart recorder with the storage capacity and flexibility of a data logger. Like a chart recorder it displays a chart of historical data, but unlike a chart recorder it stores months and even years of history, does not require a paper chart, pen or a staff member to change the chart. Like a data logger it continually samples and stores data, but unlike a data logger it does not require a computer to set it up or view the data once it is collected. The TV2 monitor can be added to a Local Area Network with a CAT 5 cable. Once it is a part of the network, the current conditions and the logged data can be accessed with any PC on the network. A special feature of the free TView PC software makes it possible for all data to be copied to files on a computer and text or email alerts sent over the internet if an alarm occurs. Power out alarms as well as high-low alarms for each sensor are set on the monitor and ensure that if any condition becomes unsafe, the user is immediately notified. A. Our TV2 temperature sensor is accurate to ±0.3°C. Q. How accurate is your humidity sensor? A. Our humidity sensors is accurate to ±3.0%. Q. Do I need both a humidity and a temperature sensor? A. No, the temperature sensor and humidity sensor are built into one module measuring 2″ x 2″ x 1″. Q. Can I print out a log of temperature and humidity? A. Yes, the logged data can be downloaded to a PC at any time and a color chart of conditions can be printed. Q. How accurate is the differential pressure sensor? A. It has a range of ±1″wc with an accuracy of 0.007″wc. Q. Can I actually monitor an oven, a fridge, a freezer and temp/RH of a room with one display? A. Yes. The monitor has slots for four sensors. Q. Do I need technical help to install the TV2? A. Not usually. If help is needed we can supply it via telephone, which is almost always sufficient. If you have a very large computer system your are integrating the TV2 into, you might need some help from your IT department. Q. Can I see the current temperature, humidity and pressure on my phone or from my home computer? Q. Does the TV2 monitor meet FDA requirements? A. Yes. It meets and exceeds all requirements for monitoring temperature and humidity. Q. How far away can the sensors be mounted from the TV2 monitor? A. The wireless sensors have a clear line-of-sight range of ~ 100 feet. Metal racks and walls between the sensors and monitor will decrease the range. Q. How can I get the sensors further away from the monitor? A. Our wired sensors which can be extended to hundreds of feet. Q. What is the difference in accuracy between wired and wireless sensors? A. The accuracy is identical. Q. Do I mount the monitor in the office even though the sensors are in the warehouse? A. It depends. If you are using wireless sensors the range will cut down if the signals have to go through walls. However if you place the monitor and sensors in the warehouse and plug the monitor into a wired Ethernet socket you can view the data on any computer which is part of the same LAN. A. No. Each wireless sensors is powered by a 9 volt DC battery which has a life of about a year? Wired sensors are powered by the monitor. A. Every eleven to twenty seconds if you are using wireless sensors. If wired sensors are being used the display is updated every 4 seconds. A. This can be set to any interval between once a minute to once a day. Each sensor can have its own data-logging interval. The default interval is every 10 minutes. Q. How safe is the logged data?